Over 140 of the 188 Saab dealers nationwide have retained the law firm of Bellavia Gentile & Associates, LLP, to represent the dealers in their claims against Saab Cars, N.A., a subsidiary of the Swedish car manufacturer, Saab Automobiles. Saab Automobiles filed for Bankruptcy in Sweden on December 19, 2011.
warranty repairs for their customers”, said Leonard A. Bellavia, Senior partner at the firm. 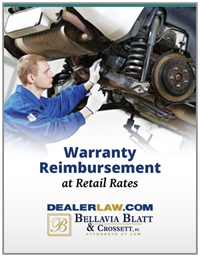 Bellavia continued; “Our firm has gone up against all of the major automobile manufacturers to protect the rights of dealers. The manufacturers know and respect us, so we believe that we can cut through a lot of the acrimony which typically exists and reach a resolution that will benefit the dealers”. Ultimately, it is Mr. Bellavia’s hope that all Saab dealers join the group. “There is strength in numbers” said Bellavia, “which provides dealers with the ability to level the playing field with the manufacturers”. After numerous attempts to sell the assets of Saab Automobiles to investors with the hope of keeping U.S. Saab dealers viable, General Motors, which owns certain critical technologies licensed to Saab, effectively blocked any potential sale. The result has left U.S. Saab dealers in turmoil as they question the ability to sell remaining vehicle inventories the value of which may be compromised due to the manufacturer’s inability to honor vehicle warranties. Faced with these issues, Saab dealers, through their National Dealer Council have retain ed the nationally acclaimed dealership law firm of Bellavia Gentile & Associates, LLP to negotiate with Saab Cars N.A. and to determine what additional action may be necessary in order to protect the dealers. Bellavia Gentile & Associates, LLP is a Mineola, New York based law firm with additional offices in Manhattan, Albany and New Jersey. The firm served as Co – Lead counsel for terminated dealers in the recent Chrysler bankruptcy proceedings and represents over 1,000 automobile dealers nationwide. Mr. Bellavia serves as Chair of the Litigation Section of the National Association of Dealer Counsel, an organization of over 500 attorneys nationally who concentrate in the representation of automobile dealers. For more information about this story and to speak with Mr. Bellavia and one of the New York Saab dealers, call Cecilia Alers.